NEW YORK, United States (AFP) — Klay Thompson’s blistering performance from three-point range propelled the Golden State Warriors to a 130-111 NBA victory over the injury-depleted Los Angeles Lakers on Monday. Thompson joined former Denver Nuggets point guard Ty Lawson as the only NBA players to make their first 10 attempts from three-point range, finishing 10-for-11 from beyond the arc and 17-of-20 overall for 44 points before sitting out the fourth quarter. By then the two-time defending champion Warriors were up 110-80 against a Lakers team missing injured superstar LeBron James along with guards Rajon Rondo and Lonzo Ball. “Regardless, it’s a good win,” Thompson said after the Warriors wrapped up an eighth straight victory. Kevin Durant added 20 points for the Warriors and Stephen Curry supplied 11 points and 12 assists, but it was Thompson in the spotlight having clearly sorted out the shooting troubles plaguing him in late December. 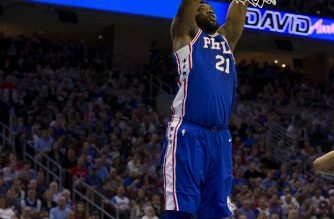 In Philadelphia, 76ers big man Joel Embiid scored 32 points and grabbed 14 rebounds as the hosts withstood a 37-point performance from James Harden in a 121-93 victory over the Houston Rockets. Harden notched his 20th straight game with 30 or more points, but the Rockets were no match for the 76ers in a sometimes testy encounter. 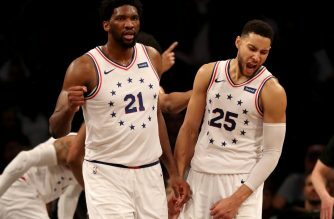 Embiid added two assists, two steals and three blocked shots, provoking the ire of Harden in the final minute of the first half when he leaned in to guard the reigning NBA Most Valuable Player as he drove toward the basket. Harden hit the court and as he rose the two traded words, both drawing technical fouls. Embiid then blocked a Harden shot from behind as the half ended with the 76ers leading 65-50. Philadelphia out-scored the Rockets 29-13 in the third period pushing their lead to as many as 31 points. With the game out of reach, Harden sat out a fourth quarter that saw both team’s starters mostly on the bench. Harden admitted that the Rockets may have been feeling the effects of two straight overtime games — a loss to Brooklyn on Wednesday and a win over the Lakers on Saturday. 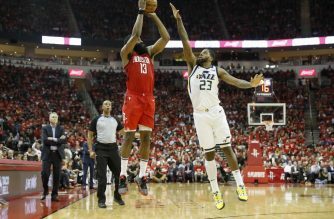 “It’s one of those games in the course of an 82-game season that you just have to wash away,” Harden said. In New York, Oklahoma City’s Paul George scored 31 points while Russell Westbrook added 17 points, 10 rebounds and nine assists as the Thunder routed the Knicks 127-109. Germany’s Dennis Schroder added 17 points off the bench while Jerami Grant and reserve Abdel Nader each contributed 16 points for Oklahoma City (28-18) in the Martin Luther King Jr. holiday romp. The Thunder jumped ahead 34-16 after the first quarter and never looked back after quieting the Madison Square Garden crowd. 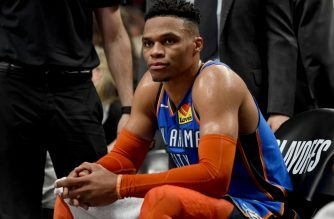 The Thunder, third in the Western Conference behind Golden State and Denver, is keeping a focus on the playoffs even as they take care of business during the season. Tim Hardaway Jr. led the Knicks (10-36) with 23 points, but New York’s losing streak stretched to six games. Greek star Giannis Antetokounmpo scored 31 points and grabbed 15 rebounds to power the NBA-best Milwaukee Bucks over visiting Dallas 116-106. Slovenian rookie Luka Doncic led Dallas with 18 points, 11 rebounds and 10 assists — the first triple-double of his NBA career. The 19-year-old joined 76ers guard Markelle Fultz as the only teenagers ever to post triple-doubles — scoring in double figures in three key statistical categories — but didn’t feel much like celebrating. “I’m happy for my triple-double, but I would prefer a win for sure and I didn’t play good at all,” Doncic said. D’Angelo Russell scored 31 points and handed out eight assists to lead the Brooklyn Nets to a fourth straight victory, 123-94 over the Sacramento Kings.